Hailed as one of the best guitarists in Louisiana by Offbeat Magazine, John Lisi rocks everything from Strat to Dobro, and shines as a master of mandolin, electric, and acoustic guitar. The New Jersey native made his home in New Orleans in the late 90s where his dexterity and skill have served the likes of Dr. John, Cyril Neville, Galactic, and Tab Benoit. 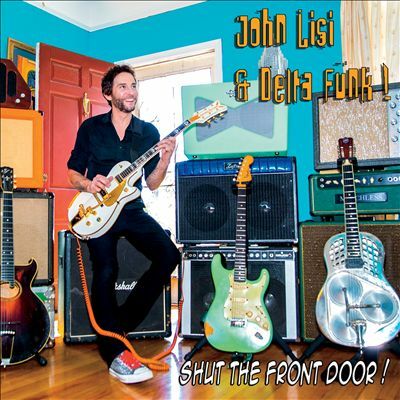 Shut the Front Door is John Lisi and his band Delta Funk!’s standalone brand of Big Easy blues, rock and boogie, with offbeat portrayals of everyday life turned into body shakin’ music that just makes a person feel good. NOLA “stank” funk to set the table with a rippin’ guitar solo! A mournful 12-bar blues, with a 50’s style horn section with a Lowell George / Duane Allman slide ride to bring us home. If CCR formed in the Big Easy this may be what they sound like. No those aren’t cellos, my friend; it’s all Dobro! A slammin’, rockin’ dobro/horn throwdown! NOLA meets Memphis in this soulful lament to the long lost joy of flipping the dial. Yeah, we dig Little Feat… who doesn’t? Lots of swagger, lots of slide, and lots of horns! Gotta make the ladies groove! An instrumental space trip to visit Mr. Hendrix and friends. Like dropping your Krispy Kreme donut on a dirty church floor. No sugar-coating on this gritty, blues-gospel. Funk goes folk in this acoustic blues with Queen’s amazing singing and writing. The bookend of the record, courtesy of Uncle Bernie’s freestyling rap. Download John Lisi’s press kit here.